Lisa VA steriliser fits perfectly into your dental practice. 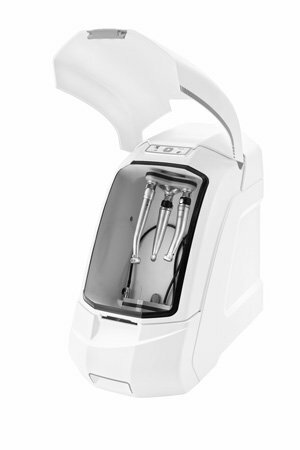 Below: Assistina 3×3 is a fully automatic cleaning and maintenance unit for dental handpieces. A vital requirement of maintaining infection control in the dental setting is the effective reprocessing (cleaning and sterilisation) of reusable medical devices (RMDs) such as surgical and clinical restorative handpieces.1 According to Australian Standards AS 4815, critical and semi-critical RMDs must be cleaned and sterilised in a steam steriliser using the appropriate cycle, with critical RMDs kept sterile in a pouch or similar, while AS 4187 states both critical AND semi-critical need to be stored sterile in a pouch. If the pouch or bag is torn or compromised, the instrument must be reprocessed. Sterilisation alone may not be effective without prior cleaning with an appropriate detergent to remove biofilm and other contaminants from both the surface and the inside of handpieces prior to sterilisation. Automated instrument processing units (such as the Assistina 3×3 and the fast new Assistina TWIN) are recommended by the ADA over manual processing as they provide more consistent results and avoid over-oiling the instrument which can interfere with the sterilisation process. Assistina 3×3 uses W&H’s gentle, slightly alkaline (pH 7.6) water-based ActiveFluid™ prior to flushing and lubrication. Importantly, ActiveFluid contains an anionic surfactant, which is ideal for cleaning and neutralising acidic organic contaminants such as blood and saliva while inhibiting the growth of viruses and bacteria. Meanwhile, the Assistina TWIN, which uses innovative oil nebulisation technology, can clean the coolant water and coolant air lines and lubricate a handpiece in just 10 seconds, eliminating lubricant wastage and keeping costs down to just a few cents per handpiece. Any errors in steriliser cycle selection and air leaks in the steriliser chamber can compromise infection control. The new Lisa VA steriliser’s Universal B cycle is suitable for all load types (solid, hollow, porous), whether unwrapped, wrapped or double-wrapped, ensuring ‘hospital grade’ sterilisation of all instruments. 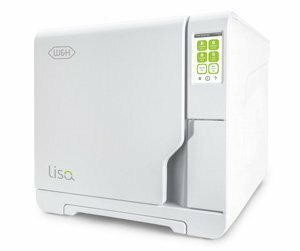 The Lisa is the only benchtop steriliser with an air leak detector to measure and ensure steam saturation into instrument lumens is achieved every cycle. In keeping with Australian Standards, AS 4815 & AS 4187 for cycle records, Lisa automatically captures all cycle parameter data including the operator who released the load on internal memory and USB. 3. Any chemical indicators have changed colour to indicate a pass. The Lisa also has the option of operator identification with password-protected PIN number (electronic signature) for accurate record keeping; as well as a delayed start feature, which means the test cycle/s can be completed prior to staff arriving at the practice. Running a sterilising cycle overnight is also available with the Lisa software switching the condenser fan on/off when required to ensure a dry load at release in the morning. The Lisa VA can also be monitored in real time over wireless on the free Lisa app for tablets and smartphones, greatly streamlining the management of the sterilisation process. The W&H Assistina range and Lisa sterilisers are exclusively available from A-dec. Phone 1800 225 010 or visit A-dec.com to locate your nearest A-dec dealer.